Made with Pace® Chunky Salsa, this sauce is a delicious twist on traditional hollandaise. 1. Melt butter but do not brown. 2. Blend egg yolks until light in color. 3. Blend on medium speed and temper egg yolks by slowly adding hot butter to blender. 4. 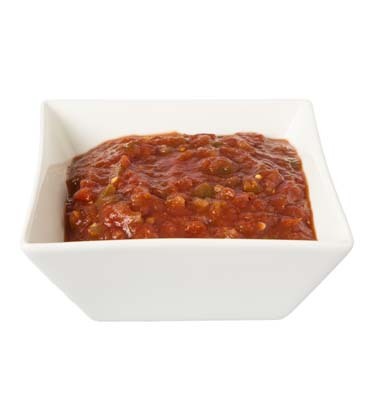 Place Pace Chunky Salsa into stockpot for 3-5 minutes, until warm. Slowly add to the egg and butter mixture and purée. 5. Hold warm to serve. This sauce can also be made over a double boiler or direct flame. Keep warm; hollandaise can break if it is too hot. To hold sauce warm, add boiling water to an insulated coffee urn, allow it to sit for 3 minutes, remove water and hold sauce inside. Perfect with poached eggs, fish, chicken, or steak.